The GWR engine shed at Stourbridge was located on the west side of the former Oxford Worcester & Wolverhampton Railway (OWWR) line about a quarter of a mile north of Stambermill Viaduct on the section of line between Stourbridge and Brettell Lane. After the shed was closed the site was developed for housing. Clive Butcher states that in 1870 the GWR constructed a brick-built four-road shed with gable ends. In 1926 a 28-road roundhouse was demolished. Ray Humphries made a visit to Stourbridge locomotive Sheds on 5th July 1959. The main reason of his trip was to see the ex- Swansea Harbour Trust saddle tank No.1142 at Clee Hill Quarry. On the way there he called in at the sheds at Stourbridge and noted the following locomotives on shed: Nos.3658; 5795; 5189; 3667; 2871; 4986 'Aston Hall'; 3846; 2885; 5198; 6803 'Bucklebury Grange'; 3827; 6810 'Blakemere Grange' 6317; 6667; 8797; 6609; 6930 'Aldersley Hall'; 2856; 2897; 5176; 3821; 7229; 2867; 7430; 3825; 3649; 3745; 7449; 4646; 9782; 9624; 6646; 4173; 6105; 1621; 6604; 7435; 3729; 9636; 6401; 7441; 4687; 6683; 4168; 4161;6987 'Shervington Hall'; 6692; 3743; 6332; 5199; 8704; 4140; 7448; 3710 and 7429. 0-6-0 Pannier tank engines: 3745; 4630; 4646; 4665; 4687; 4696; 6403; 6418; 6422; 7430; 7432; 7435; 7449; 8742; 9614; 9624; 9646; 9733 and 9782. 0-6-2 tank engines: 6646; 6678; 6683 and 6692. 2-6-2 tank engines: 4114; 4140; 167; 4168 and 5192. 2-6-0 tender engines: 7312. 2-8-0 tender engines: 3809.4-6-0 'Castle' class engine: 5015 - 'Kingswear Castle'. 4-6-0 'Grange' class engines: 6811 - 'Cranbourne Grange' and 6842 - 'Nunhold Grange'. 4-6-0 'Hall' class engines: 4964 - 'Rodwell Hall'; 5988 - 'Bostock Hall'; 6986 - 'Rydal Hall'; 6989 - 'Wightwick Hall' and 7922 - 'Salford Hall'. Ex LMSR design class 8F 2-8-0 tender engines: 48330; 48424; 48430; 48459; 48460; 48474; 48475 and 48724. Diesel Shunters: D3004; D3029; D3115; D3518 and D3980. Ex GWR 0-6-0 Pannier tanks 3607, 3619, 4646, 4696, 8718, 8767, 9608, 9614, 9641. Ex LMSR Stanier class 5MT 4-6-0 tender engines 44875 and 45064. Ex LMSR Ivatt class 2MT 2-6-0 tender engines 46427 and 46492. Ex LMSR Stanier class 8F 2-8-0 tender engines 48121, 48410, 48415, 48417, 48424, 48450, 48460, 48468, 48531, 48550 and 48757. Class 47 diesels D1662, D1714 and D1910. Diesel shunters D3004, D3029, D3192, D3981, D3982, D3995, D3996, 15101 and 15102. A group of ex GWR 0-6-0 Pannier Tanks (Nos.4646, 9614, 3619, 9608, 8718 and 9641) around the turntable. 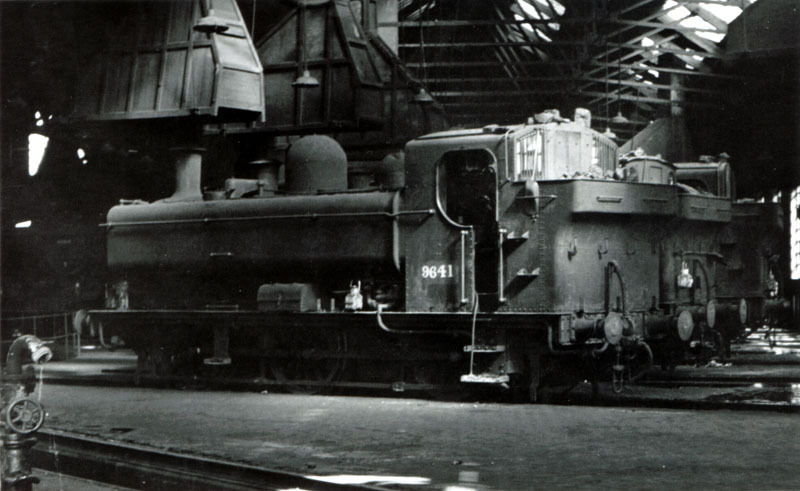 at Stourbridge Locomotive Sheds on 5th June 1966. Seen on the same date is another ex-GWR Pannier Tank No.9641 sadly shorn of number plates. Both photographs by courtesy of Peter Martin. 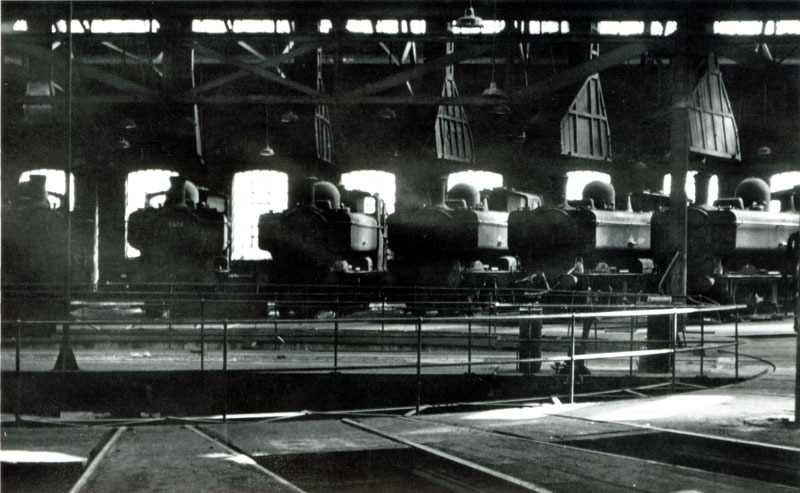 Stourbridge Locomotives Sheds were closed to steam on 11th July 1966 and the roundhouse taken out of use. Diesel Multiple Units were serviced in the orignial shed until that too closed on 6th May 1968. Both sheds were demolished soon after closure. 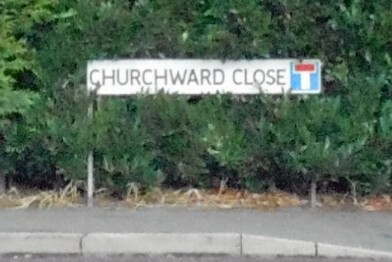 The housing estate built on the site of the locomotive sheds is easily located as the roads are all named after officials of the Great Western Railway. Photograhs of the signs taken by Andrew Smith on 17th October 2013. 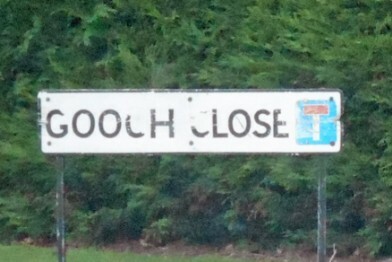 The British Locomotive Shed Directory by Aidan Fuller states that the shed entrance could be found on the right-hand side by walking up a cinder path between a level crossing and the gas works. 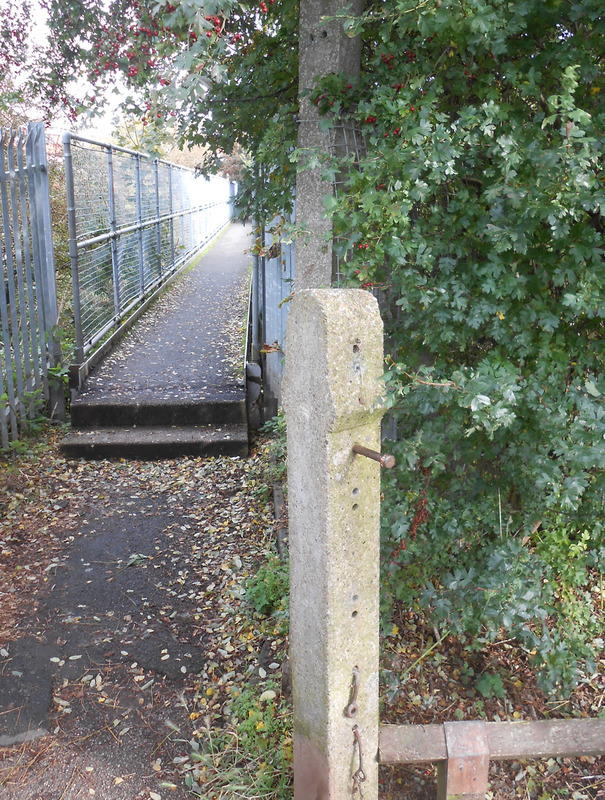 This path is still in use and few yards beyond the former shed entrance the path crosses the ex-OWWR as can be seen in the photograph above, taken by Andrew Smith on 19th October 2013.